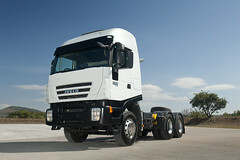 If you think you can find better value Iveco parts elsewhere, think again. Only the Iveco Dealer network carries an extensive range of Origin 100% Iveco parts, backed by first class levels of service and off-the-shelf availability. We understand how important it is to deliver right first time, on time, every time and take pride in keeping close to our customers and their transport needs. Take up the Parts Price Challenge now, we look forward to being of service to you. AdBlue: ​​less consumption, more respect for the environment. PETRONAS LUBRICANTS: Your vehicle in good hands.